Gudi Padwa is the Hindu New Year in Marathi culture as per traditional lunar calendar followed in Maharashtra. Gudi Padwa 2019 date is April 6. It is observed mainly in Maharashtra, Goa and parts of Karnataka. As per traditional Marathi calendar, this New Year is the Vikari Nama Samvatsara and the Shri Shalivahan Shaka 1941 begins on the day. The first month in the Marathi calendar is Chaitra and Gudi Padwa is observed on Chaitra 1 or the first day of Chaitra. The most important event on the day is the hoisting of the Gudhi (victory flags) in front of the homes. Ugadi (Kannada and Telugu New Year) will be observed on April 6, 2019. Vikram Samvat 2076 begins in North India on the day. 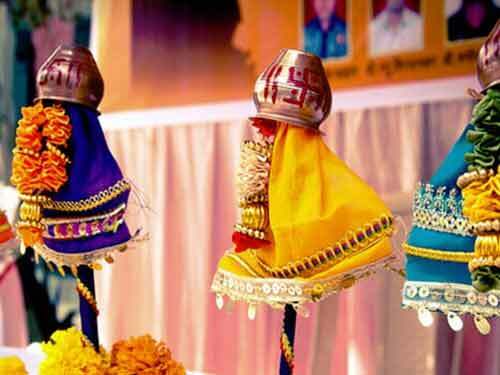 Why is Gudi Padwa Observed? There numerous reasons for observing Gudi Padwa - the most important legends are the defeat of Shakas by Shalivahan and some people observe it to commemorate the victories of Chatrapati Shivaji Maharaj. As per Brahma Purana, Lord Brahma created the universe in the morning of the first day of Chaitra month. Some say it is hoisted to the celebrate Lord Ram’s return to Ayodhya after killing Ravana. In order to protect one's family from difficulties and calamities, the head of the family performs puja on the Gudi Padwa day. It is dedicated to Lord Ganesha, Lakshmi, Saraswati and the family deity. The puja is also performed for a prosperous year. The most important event on the day is the hoisting of flags on a bamboo staff. The flag hoisted on Maharashtrian New Year is made of green or yellow colored silk cloth. A bright garlanded goblet is hung on top of the flag pole. Neem leaves, mango leaves, garland of red flowers and gaohi (sweet) are hung on the Gudhi. Rangoli is drawn near the Gudi or in front of the house. Offering made of neem leaves and neem flowers and jaggery is distributed on the day. The offering consists of neem leaves and neem flowers, soaked dal, cumin seeds, honey or jaggery and asafetida. The offering symbolically indicates that life is filled with joy and sorrow. Gudi Padva is one of the most auspicious days in the Marathi Hindu Calendar and is considered ideal for starting new ventures and investment. It is believed that every moment on the Gudi Padwa day is auspicious. The day also heralds the arrival of the spring season. Several auspicious events take place on this day. It is believed that every moment on this day is auspicious. Apart from this, Maharashtrian households prepare the delicious ‘puran poli’ and distribute it to neighbors, relatives and friends. A sweet dish prepared using jaggery and wheat flour. Farmers make it a point to plough the field on the Gudi Padva day and they believe it will help in having a good harvest in the ensuing agricultural season. When Gudi Padwa is celebrated by Marathi people, the Kannada and Telugu speaking people celebrate Ugadi.